The greenstriped mapleworm, Dryocampa rubicunda, is found throughout the Eastern United States and Canada. Maples are its preferred hosts and the most common hosts in many landscapes. Some oaks can also be damaged especially when in close proximity to maples. In North Carolina, moths emerge from their pupae in late April or early May. They are commonly known as the rosy maple moth. The body of the moth is yellow on top and pink on the bottom with wings exhibiting yellow and pink colorations that vary in design. The moths deposit yellow eggs on the underside of leaves. The larvae have red or black heads, pale-green bodies with seven dark-green longitudinal stripes. There are two prominent horns on the second thoracic segment, two rows of short spines on the side of the body, and four larger spines on the terminal abdominal segments. Full-grown larvae can reach 40 mm in length. Adult moths can have a wingspan of 37 to 50 mm. Larvae are the only herbivorous life stage, capable of devouring several entire leaves per caterpillar. Large populations of mapleworms can defoliate trees if unnoticed or without proper management. Rarely will the tree suffer long term damage but loss in growth and branch dieback may occur if the same tree is defoliated several consecutive years. Older literature refers to episodes in which the first generation strips maples bare, and then just as a new flush of growth emerges, the second generation emerges to defoliate the trees again. This type of defoliation can seriously weaken maples to the point that borers and fungi may infest the trees and finish them off. Rosy maple moths are about an inch long and are pink and yellow. Greenstriped mapleworm egg cluster on the underside of a maple leaf. Greenstriped mapleworm larvae from above feeding on a maple leaf. Late instar greenstriped mapleworm larva. Greenstriped mapleworm pupae are dark and are found in soil beneath maple trees. 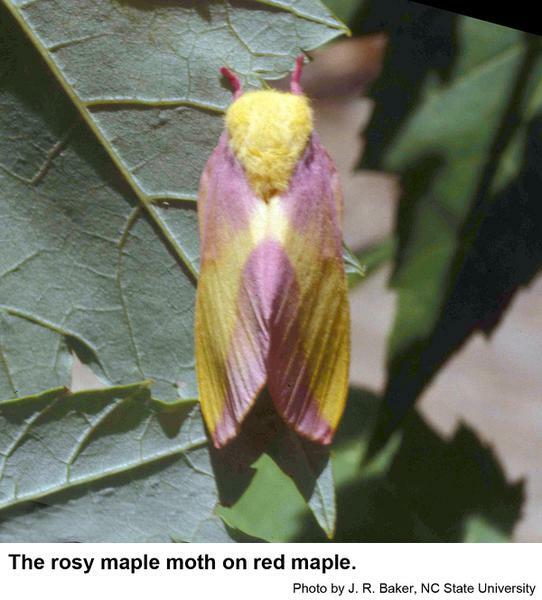 Rosy maple moths lay eggs on the underside of leaves on the outer edge of the tree canopy from May to June in North Carolina. These eggs hatch in approximately 10 days, releasing ravenous caterpillars into the tree canopy. Mapleworm larvae feed on tree foliage from the time of emergence until they are able to pupate. Larvae feed in aggregates up until the third instar at which point they begin to feed individually. After about one month the larvae crawl to the ground to pupate. In the southern United States, adults will emerge in about two weeks and begin the second generation of the year. Up to three generations may occur in the southern United States but only one generation occurs in the northern United States and Canada. 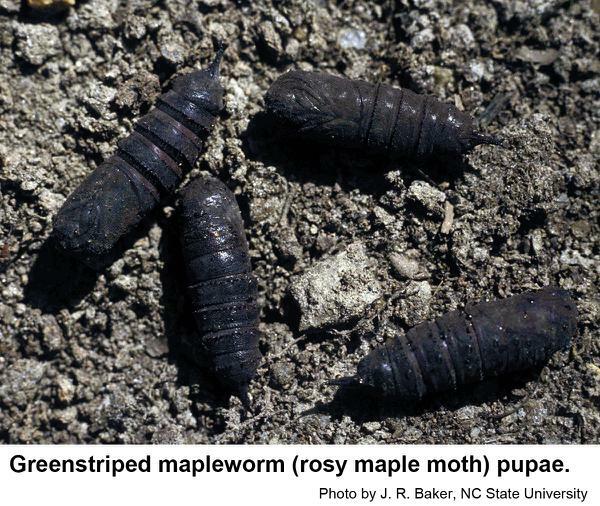 Mapleworm pupa overwinter in the soil typically under a host tree. First instar greenstriped mapleworm caterpillars feeding on a maple leaf. Older greenstriped mapleworms feeding as a group. Periodically examining the underside of several leaves per tree from May through June for egg masses and removing those leaves or destroying the eggs can help reduce tree damage. Surveying tree canopies for leaf defoliation is one of the best ways to catch an infestation after egg hatch. Examining a tree canopy from a distance where the entire tree is in view can help identify patches of infestation where there are bare branches whose leaves have been eaten. Caterpillars will generally be found feeding on leaf margins eating towards the midvein. If one caterpillar is found, there are likely many others on the same tree. Look for frass on the ground beneath trees. 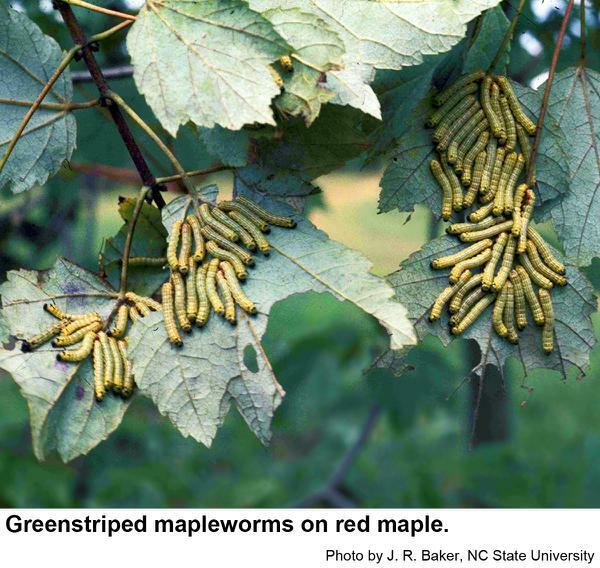 There are no established aesthetic or damage thresholds for greenstriped mapleworm. Populations can become large enough to defoliate trees but this is rare. Frass on patios and decks can be a reason some people seek intervention. Reducing plant stress by proper planting and watering may reduce susceptibility to pest infestations. However, excessive fertilizer may increase pest abundance by making trees more nutritious to pests and reducing the trees’ natural defenses. If clusters of yellow eggs are found, scrape them off or remove the entire leaf to reduce the caterpillar population. Since the caterpillars feed in groups, often a single branch is infested that can be pruned. The greenstriped mapleworm has several natural enemies but none have been recorded in great abundance. Studies have shown that less than 10% of larvae will be parasitized in natural populations. Other predators such as birds may also provide some biological control. If chemical control is necessary, Chlorantraniliprole (Acelepryn) can provide effective foliar and systemic control while having a relatively low impact on non-target organisms. Bacillus thuringiensis (bt) and spinosad are also among the insecticides for caterpillar control with low impact on non-target organisms. Broad-spectrum insecticides like pyrethroids and acephate are not recommended because they will also kill beneficial insects. See complete list of labeled insecticides in the North Carolina Agricultural Chemicals Manual. Biology, Injury, and Management of Maple Tree Pests in Nurseries and Urban Landscapes. S. D. Frank, S. D., W. E. Klingeman, III, S. A. White, and A. Fulcher. 2013. Journal of Integrated Pest Managment. 4(1): 1-14. Greenstriped Mapleworm. Hale, F. A. and J. Yanes Jr. Undated. Insects. SP290-Y. Univ Tennessee Extension.